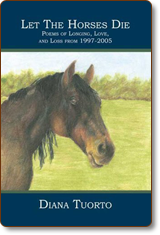 Let The Horses Die© (ISBN: 1-4196-2670-1) is a collection of honest and thought-provoking poetry. The poems in Let The Horses Die detail a young woman's journey from a teenager to adulthood, chronicling a rollercoaster of emotions and experiences along the way. From feelings of despair and anger come resilience and strength. Inspired by such notable poets as Edgar Allen Poe, Maya Angelou and Elizabeth Barrett Browning (to name a few), Diana's poems serve as a personal collection of moments that many young people have experienced. Incredibly open and direct, this poetry collection includes Diana's best works, from a shy, seventeen year-old student to a mature twenty-five year-old. I let a horse die today. I close my eyes, and I can see. Bodies worth less than a can of dog food. As they echo against the steel ceiling. He’s wondering why he’s there now. Why his soft bedding and food are gone. Didn’t love him, didn’t come. As he is slammed against the wall. Of fierce hits and violent tongues. What did I give him in return? Far away, to parts unknown. To have someone save him. And he could be alive. But now, he stands there waiting. And I would find him, if I could. Read reviews of Let The Horses Die.